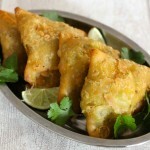 A samosa is a small triangular fried snack from northern India that is traditionally filled with vegetables and spices. In the bowl of a stand mixer, combine the flour, cardamom, baking soda and salt. Add ghee and lassi and mix with until dough becomes sandy. Pour ½ cup of water and, using the dough hook, mix for 4 minutes. Add remaining water gradually if necessary. The dough should quickly become soft, smooth and elastic. Form a ball with the dough, lightly coat the entire surface with oil, and cover with a cloth. Set aside at room temperature for 1 hour. Heat oil in a skillet over medium heat and pour the onion and ginger. Sauté for 2 minutes until the onion is soft, then add the garlic. Add peas, hot pepper and carrot and cook on low heat for 5 minutes. Finally, add the mashed potatoes and the other ingredients. Mix well and cook over low heat, covered for 5 minutes. Vigorously mix the flour and water until reaching the consistency of a thick cream. Divide dough 8 equal pieces. Take each piece of dough and roll it between the palms to form a smooth ball. Roll out the dough thinly and cut it in half to get two half circles. Use a brush or your fingers to apply some glue to the edges of the dough. Fold and stuff the cone with the mixture of mashed potatoes, carrots and peas, as shown in this video. Carefully slide samosas in the oil and fry until golden. If you do not serve the samosas immediately, deep fry them again for 1 minute before serving. Serve hot or warm with cilantro sauce or tamarind chutney.